The Stolen Generations' Testimonies Foundation hopes the online museum will become a national treasure and a unique and sacred keeping place for Stolen Generations’ Survivors’ Testimonies. By allowing Australians to listen to the Survivors’ stories with open hearts and without judgement, the foundation hopes more people will be engaged in the healing process. In 2009 more than thirty Stolen Generations’ Survivors shared their stories, their memories and themselves in the first round of interviews for the ‘Stolen Generations’ Testimonies Foundation’. These are their testimonies. Thank you to those Survivors for their generosity of spirit in sharing their testimonies with us. ​Please click on the images to view the video testimonies. The Stolen Generations Testimonies Project was initiated by filmmaker Melanie Hogan (www.melaniehogan.com) soon after the release of her acclaimed documentary film Kanyini (www.kanyini.com), featuring Stolen Generation Survivor Uncle Bob Randall. One of the key aims and objectives when making Kanyini was to encourage more Australians to walk in the shoes of their Indigenous brothers and sisters. To go deeper. To begin to learn, to respect, to understand, and to start a friendship with Indigenous Australians; a friendship that has been missing for so long. One key element in the film KANYINI was the importance of Aboriginal people to connect to family, in order to feel whole. The policies that created the Stolen Generations of Australia cut very deeply, the chord between many Aboriginal children and their parents. 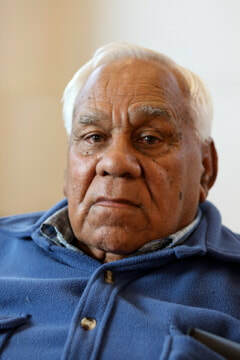 Uncle Bob Randall and Melanie Hogan therefore felt it was incredibly important to create a platform so that survivors of the Stolen Generations could share with Australians their loss and their resilience, so that we could all heal together. Thus the Stolen Generations Testimonies project was born.